2012 is a year of celebrations in London- the Olympic Games and the Queen’s Diamond Jubilee. Not to be left out, IH London is celebrating its own golden jubilee – 50 years since the first ground-breaking teacher training course took place. To mark this very special year, IH London has organised a variety of celebratory events throughout the course of 2012. The celebrations kicked off at the annual IH Director of Studies Conference when the DoSes’ knowledge of teacher training at International House was tested with a special TT round of questions during the pub quiz. 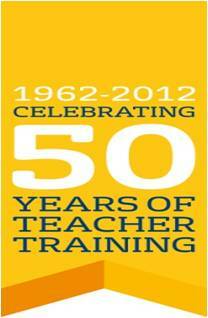 How much do you know about teacher training at IH? Can you do better than the IH DoSes? Click here to see the quiz and test your knowledge! The next event to take place was a party held by IH London at the IATEFL conference in Glasgow in March. The event was hosted by course book writer and IH trustee, Simon Greenall, and guests Jeremy Harmer, Dr Susan Barduhn (SIT, Vermont and former Director of IH London) and Ken Wilson (the coursebook writer and founder of English Teaching Theatre) also reminisced about their time at IH. In the words of Steve Brent, Director of IH London “the IH Party at IATEFL was extremely well – received and it was clear from the people in the room that there was a genuine affection and warmth for IH that went beyond the norm. Lucy Horsefield (IH World) announced that IH affiliates would be offering 50 Teacher Training Scholarships as part of the 50th celebrations.”. The next event to take place in this year of celebrations will be a special evening reception held in IH London itself in May. Many of the pioneering figures in teacher teaching are expected to attend alongside current IHL trainers and colleagues from the industry. Matthew Bullock, the Chair of the IH Trust will open the event and there will also be a display of photos and other memorabilia following the journey of teacher training from 1962 to the present day. 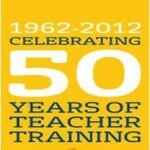 IH London is also hosting two keynote talks about the way forward for teacher training. The first talk will take place on Saturday 16th June at 11 am and the speaker will be Guy Cook, currently Professor of English with the Open University and an author whose books include Translation in Language Teaching (2010) (Winner of the International House Ben Warren Prize), Genetically Modified Language (2004), Applied Linguistics (2003). In his talk,’Moving targets in ELT: the secret of relative success’ he will be reflecting on the last 50 years of ideas and practices in ELT. The talk suggests that there is no simple measure of successful language teaching and learning. Measures (in both senses of the word) must change with the times, and go on changing, as new circumstances in the world create new learner needs in the classroom. So, paradoxically, the absolute criterion for success may be to realise that there isn’t one. Perhaps this is why International House has not just kept up with the times, but kept ahead. Diane Larsen-Freeman, Professor of Education, Professor of Linguistics, and Research Scientist at the English Language Institute, University of Michigan will be the second keynote speaker and her talk, ‘Are there stages in teacher development?’ will take place on Saturday 24 November at 11 am. Diane will be arguing that the sequence of stages from novice to mastery as identified within many developmental phenomena does not exist in teacher development, and that a trajectory with an implied endpoint is not a useful way to think about teacher training/education. The IH Journal will also be publishing a very special bumper teacher training edition in the autumn with contributions from those involved in teacher training both externally and from the IH network of schools. Back to Issue 32: Spring 2012 of the IH Journal of Education and Development.